A full-size drawing helped Lowe deter -mine critical design and construction aspects for this side table. Before putting tool to wood, he worked out the curves of the rails, the taper of the legs, the overhang of the top, the joinery, and a precise cut list. This contains a detailed cut list and hardware list. The front view illustrates what the piece will look like head-on. As is often the case with the plan view, when a piece is symmetrical around its oentertine, only a half view is necessary here. The side view is drawn by carrying over lines and dimensions from the plan and front views. Illustrators and draftspeople use a variety of line styles in drawings to make them easier to understand. Show any hidden element. I Dotted lines touc+i at comers so that the I / eye will pick up the shape more cleaily. Centetline Indicates that the object is symmetrical around this line. Means that the object continues, but drawing is cut off here. 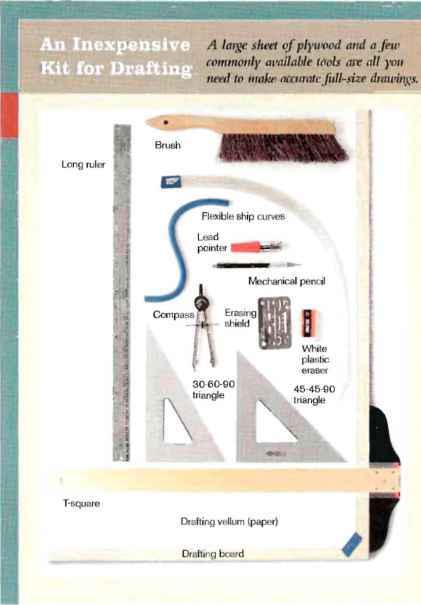 Ar mental operations.The fu st tool, the T- square or parallel rule, is used to draw horizontal lines. Second is the triangle: Hither the 30-60-90 or the 45 45-90 is used for drawing vertical lines perpendicular to the horizontals.These triangles also are used to draw common angles measuring 30°, 45°, and 60°. A straightedge is important because it can be used to draw a straight line at any angle, such as the tapers oil legs. A T-square flipped onto its back (so it will lie flat) makes a workable straightedge. The compass is the tool of choice for regular curves. I draw irregular curves freehand, which can be more pleasing to the eye than a curve made using a compass or I rench curve. I smooth out these freehand lines with a tool called an adjustable ship curve. When drawing freehand curves, the lines tend to be a bit heavy. I clean them up using an erasing shield, a thin sheet of metal with various shapes cut into it. By covering the portion of the line that you want to save with the erasing shield, you can erase the exposed part and clean up unsightly stray lines with a white plastic eraser. Then there is the pencil lead that you use. My choice is No. 4 hard lead, which is not likely to smear but still makes .1 clear line. If you use a pencil like this, you will need a lead pointer, which is a fancy term for a special sharpener. If you happen to remove the drawing from the board and discover that you need to add something, you can place the paper back oil the board, match any horizontal line with tlieT square edge and tape the drawing back in place. To help you understand the drawing process and its advantages, I'll draw (and design) a basic side table with a curved front and sides.There are many design and construction decisions to make on a table like tins- -overall proportions, curves, tapers, joinery and all of these details can be drawn 011 paper before making the first cut 111 valuable stock. Once I have the paper taped to tlie-board, the best place to start is the floor. A simple horizontal line, a couple of inches up from the bottom of the paper, does the trick. From here, I think about the overall dimensions of the table: height, width, and depth.The height is based 011 the type of table it is. I draw a light, horizontal line at 29 in. to 30 in., the standard height for a side table, which most likely will have a vase or lamp 011 it.These two lines are the beginning of the front and side views. Next, in the space above the front view, I draw a light rectangle that represents the size of the labletop .1 his is the lop, or plan, view. These few lines establish the overall size. Once 1 am happy with the proportions, I pencil in the centcrlinc 011 the plan view and carry it down to the front view. O11 most pieces of furniture, including this one, only a half view is necessary for the front and plan views. I draw everything to the le ft of the cenierline.The side view will show the entire piece. Determine the height of the tabtetop and get an idea of its overall size. Then draw the actual curved edges on the left of the centerline. Only half of the table needs to be drawn in the front and plan views. Make a pattern of the i front curve and use it to draw the side curve. Draw half of the front serpentine curve. Draw a diagonal line to locate the corner. Determine the height ol the table. DRAW HALF OF THE FRONT CURVE. Sketch it out freehand, trusting your eye. 3. Draw the overall table-top dimensions to deter mine its size; erase the right half later. SMOOTH THE CURVE. Use a flexible ship curve to create a fair, even profile. 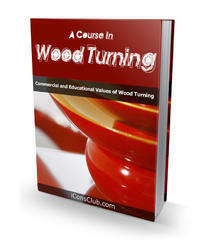 Locate the centerline of the table from the plan view and bring it down to the front view. MAKE A PLYWOOD PATTERN. Poke a series of holes through the paper lo transfer the pattern to thin plywood. DRAW SYMMETRICAL CURVE!. Use the pattern to draw a matching serpentine curve on the side rail and to lay out the actual workpieces. These half views have a few important advantages.They not only mean a smaller drawing and less work, but they also guarantee symmetry. 1 make a half template for the serpentine curve across the front, and simply flip it to lay out the other side.This is much easier than trying to draw the en tire curve and match both sides. Also, the same curve is used on the sides. I draw half of the serpentine curve across the front in the plan view. 1 draw this line freehand, working to get a curve that is pleasing to my eye. I made this tabletop twice as wide as it is deep, allow ing two important things to happen. One, the same half-serpentine curve pattern for the front can be used for the side.Two, the entire table can be doubled, turning it into a card table with an identical serpentine rail on all four sides. After drawing the curve for the front, I use a piece of X-in.-thick plywood to make a pattern of the curve by laying the plywood underneath the drawing and pricking holes along the line, through the paper and into the plywood. I saw out the pattern and smooth it with a spokeshave and sandpaper. I can use it as a template for doing the rest of the drawing, and when building the table in the shop. 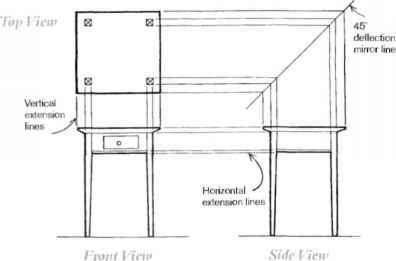 After choosing the overhang of the tabletop, draw the legs in the plan view, transfer the leg and tabletop edges to the front view, and add the tabletop chamfer and hidden lines lor the rails. \ 4. Draw the front v and side rails. Draw the tabletop in the front view. Transfer leg locations from the plan view. The overhang determines the table base Looking at tin- front and plan views, I decide ihe overhang of the tabletop. I or this table, a slight overhang will keep the tabletop from hiding the rail and will accentuate the matching curves in both. At this point, I also determine the thickness of the tabletop and draw it into the front and plan views. A heavy chamfer under the edge lightens the look. 5. Decide on the rail width. TRANSFER LINES FROM THE PLAN view to the front view. Use a long triangle to carry down the table-top and leg edges. 6. Draw the taper of the finished legs. Iront I ifw legs down into the front view. I also continue these light lines to the floor, which end up forming the rectangles of stock from which the legs will be sawn. DRAW THE RAILS IN THE TOP VIEW. Use the overhang dimension to offset the curved rail evenly from the curved tabletop. Lowe is using a triangular scale, but any ruler will do. All of the information necessary to complete the side view is incorporated in the plan and front views. To transfer dimensions from the plan view to the side view, draw a line at a 45 angle and project lines across and then down. NOW FILL IN THE SIDE VIEW, Carry over horizontal lines from the front view and transfer the other dimensions from the plan view using a 45" line or simply by measuring. Design the joinery in the plan view, find the rail thicknesses, fill in the front and side views and add the title block. FIGURE OUT THE SIDE RAIL'S THICKNESS. Start with a construction line to determine the outside edge of the rail stock, then offset a parallel line from that to find the inside edge of the rail. Locate the back edge of the side rail. Lay out joinery on the plan view. Lay out joinery on the front view. 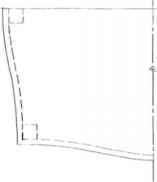 A full-size drawing makes it easy to determine necessary stock thicknesses (shaded areas) on curved parts. 5. Transfer joinery to the side view. Side View smooth curve for the rail. Next, ] pick a pleasing width for the front rail. Jumping back to the legs, 1 consider how they should be tapered—on two sides or four? Having decided that a two-sided taper looks best on this table, 1 lay out the amount of taper at the floor line and locate one end ofa long straightedge on the drawing at that point. The other end goes on a point about % in. below the rail, where 1 generally start my tapers. Develop the side view So far, I only have worked on the front and plan views.To create a side view, 1 project lines from the front view and lake the horizontal dimensions horn the plan view. Until now, only the external lines of the table have been addressed, so ifany ofthe proportions need to be changed, this is the time to do it.The white eraser will make clean work of it. Once I'm satisfied, it's time to fill in the joinery. Joinery determines the thickness of the rails first, in the plan view, 1 fill in the locations ofthe mortises and tenons. 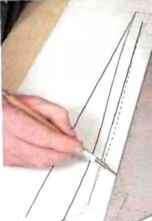 Then 1 can draw the back edge ofthe rail, determining its overall thickness. 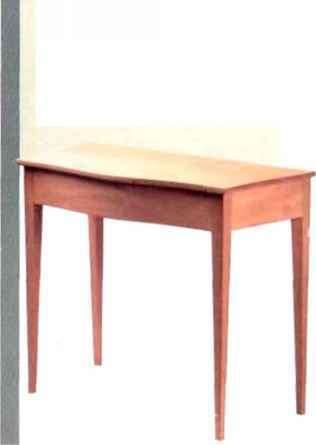 On smaller tables like this, 1 keep the front cheeks ofthe tenons A in. back from the outside ofthe leg and use a X-in.-thick tenon.These locations allow long mortises to fit inside the leg without touching one another and weakening the leg. 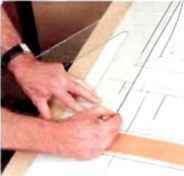 The first step on the plan view is to draw the back rail A in. thick with the standard X-in.-thick tenon. Then, after drawing the joinery on the front rail in the plan view, 1 can draw the horizontal line indicating the back of that piece, and a clear view ofthe stock develops. I can determine easily that it must be 2% in. thick to contain die curve. The side rails can be taken from a thinner piece of stock by drawing a consume -tion line from the outside edge ofthe curve to the rail's front shoulder, and then drawing a line parallel to that one to indicate the overall thickness ofthe part. Now carry the tenon thicknesses and lengths down to the front view and hi turn to the side view. One last decision that needs to be made regarding the tenons is their width and the size ofany top or bottom shoulders to make the table resist racking. 1 think giving the tenons a X-in. shoulder at the top and no shoulder at the bottom is enough. It is easier to align the bottom edge ofthe rails to each other without a shoulder to deal with, making it easier to apply any banding that might run around the bottom edge ofthe rails and across the legs. If there is no shoulder at the top, an open mortise is created and the strength of the leg is compromised. It wouldn't stand up to an accidental kick or a whack from a wayward vacuum cleaner. working school and makes period tion, keeping my self organized and avoiding furniture at his shop in Beverly, costly errors. Mass.